Miltoncontact: To Have Vision and Foresight - What you need in the current depression! To Have Vision and Foresight - What you need in the current depression! Another conversation today is with Carl Suffield of Praescio. What the hell does that mean? was my question! "To Have Vision and Foresight!" Was Carl's answer. As someone who has worked in investment and retail banking, Carl definitely needs to know how to apply these in the current economic climate. The real benefit is applying these skills for his clients. 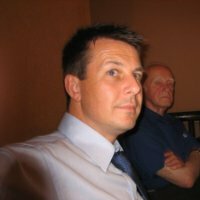 A typical situation is his work for Donovan & Dunne Ltd, a cleaning company. They are looking for improvements in the review of their cash flow and provide simple financial forecasting. The benefits Carl can bring to the company will be the expansion of the most important aspect of any business, their vital current customer base, as well as attracting future clients. They will also be looking to enhance their service level and quality even further. In these cash strapped times, having a clear immediate overview of your company's finances ensures you keep out of the red. The other advantage is that you can then see which areas to develop further. It sounds so simple, but sometimes it helps to have someone like Carl Suffield of Praescio to see the broader picture. His clients comment was "It helps me see the elephant instead of the grey!" 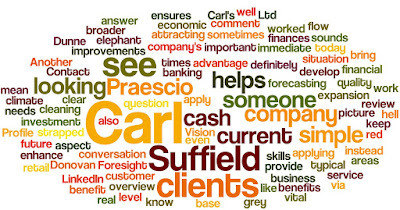 Contact Carl Suffield via his LinkedIn Profile http://uk.linkedin.com/pub/carl-suffield/13/422/5a8.